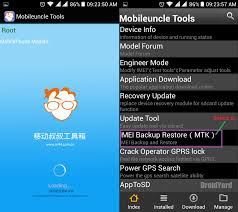 Tweaking your Android phone IMEI is good for many purposes. Sometimes to get free or awoof data plan, or to do things your phone dosent originally support. Now I will show you how you can tweak your phone imei so that you won't be missing all the freebies from our dear network providers. 2. On the app menu, tap on "engineering mode"
5. Now select "CDS information"
6. On the new page that opens, tap on "radio information"
7. Another page will open containing two options. This two options appears in phones with dual SIM but if yours is only one SIM, you will see only one option. Now select the preferred SIM you want to do it. Phone 2 is for SIM two. 8. Place your cursor just after the AT+ and type this EGMR=1,7,""
10. After typing the IMEI, recheck and see if it is 15 digits and tap on "Send at command"
If you correctly followed the instructions, am sure you should have successfully tweak your imei. If you have successfully tweaked it, Please drop a comment below. If you have difficulties while trying to tweak your imei, drop a comment below and we will attend to you as soon as possible.